DUET is the latest in a series of transportable small boats. It is a 2 module utility boat, the size somewhere between my TOTER 2 and the POLLYWOG. It's main feature is seating for a small family, 2 adults and 2 kids, with a total capacity of 500 pounds. It has good freeboard, and can accept power from a trolling motor up to 4 hp. For portability, it can fit in all pickups, most SUV's and some wagons. Of course it can be rowed or paddled, and the seats are adjustable for occupant balance. At almost 9 feet in length, and 44 inches wide, it is a roomy, stable, and safe modular boat. Total cost of building materials is under $150, excluding finish, and the construction method utilizes the proven Tape & Glue process. I believe DUET will address the needs of many small boat builders, because of it's capacity, and overall good looks. 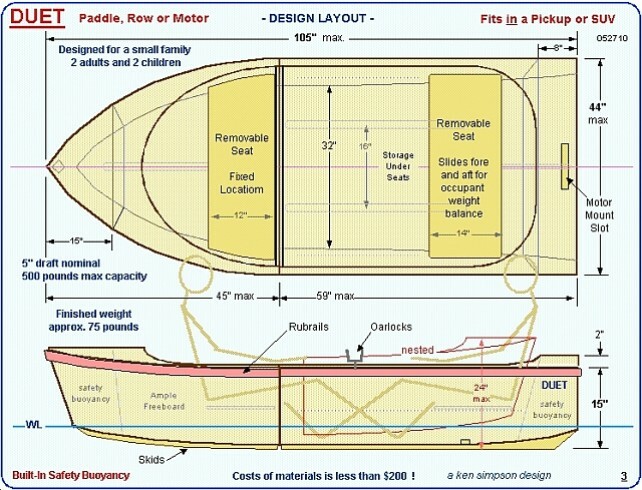 Families will enjoy it for what it is; an easy to build, simple to assemble, fun and safe reason to go boating, without having to trailer anything. There are 2 built-in buoyancy chambers, and under seat storage for provisions. This would also make a good fishing boat, or even a Tender, as it's size and weight make it easy to handle by a single individual. The plans are 30 pages of text, sketches and photos, in PDF format. All information regarding the building processes used are included, and recommendations for finishing is also addressed. As always, I strongly suggest builders make revisions to their boats that will personalize them, to satisfy their unique needs, without sacrificing the integrity of the design. PS: Construction photos will be forthcoming.